How could I be bored? The second day in the hospital is full of surprises ... like the visits from lab techs with needles, nurse techs with blood pressure cuffs and thermometers, dietary staff serving plates of mystery meat and the constant questions ... full name? date of birth? do you have any hobbies? (Just seeing if you were paying attention). Amid the excitement .. there is the ever present TV ... mounted an inch from the ceiling. Hospitals tell you that it's mounted that way so you can see it easily from the bed ... the real reason is so no one would be tempted to steal it (after all it IS a 1978 Zenith). So as I lay there slowly scrolling through the channels ... I came across something truly remarkable . Did you know that there is a "House" Marathon on the USA Network? That's right ... all House all day. I know I sound overly excited by this ... but you have to understand that I was never a House watcher. I think I've only seen the show once before. I feel like I just discovered it. For those who don't know ... House is actually Dr. Gregory House ... devoid of any bedside manner and addicted to pain killers. House walks with a cane and always has three day old beard growth (How do some guys always have exactly three days of beard growth?). He manages to treat only bizarre medical disorders and saves someone's life by doing something dramatic like shooting him with a rubber band while drinking a cup of coffee. His team includes a neurologist with a suspect past, a female immunologist, an old money intensevist, an old friend who is an oncologist and a love interest with the female hospital administrator (gimme a break). 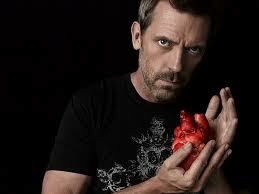 "Dr. House you can't remove his brain and play soccer with it in the hallway." "Fine with me ... I'll just tell his wife that you killed him." "How did I kill him?" "You prevented this ... although unconventional, but brilliant ... life saving treatment to cure his hiccups." "Hiccups are not life threatening." "Really! How observant ... and what will you say when we discover that he also has a rare form of brain cancer that is only diagnosed by kicking the brain on the left side at exactly the right moment that he hiccups." "But his brain will be removed ..."
"... correct ... and he will be VERY surprised ..."
"... causing him to hiccup. Brilliant Dr. House." "Yeah, yeah ... now find me some oxycodiene or cocaine or something." About that time ... the hospital administrator kicks the door open. "Oh great ... look who's here ... Lady Gag Gag." "Funny House. What the hell do you think you're doing now?" "Do you have a problem with soccer?" "Duh ... with somebody's brain?" "It's his only hope. I suppose you don't really care about curing patients ... only protecting you exceptionally cute little ..."
"Save it, House ... okay ... just this one time. Please try not to mess up the halls." "Knock ... knock ... time for blood work!" Sorry ... 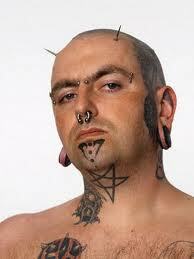 I gotta go ... another bald headed guy with tattoos on his neck is pointing a needle at me. I found your blog through a post from Randy Simmons on fb. I'm not really a blogger, but for some reason curiousity got the best of me and I'm glad it did. I am a House fan,(at least he can entertain you while you are confined)so of course I understood your recreation of what a typical conversation between his team would be. I find you to be funny, imaginative, and ofcourse an outstanding writter. The last not surprising given you profession. I am not quite ready to join THE BORN YOUNG CLUB, but I will check in to see where your thoughts go next. Omg Joel!!!! Ok-- so your heart is a-pit-a-patter and needs a "tune up". See all this healthcare compassion has gone to your heart! As you watch House- always say this when trying to figure out the diagnosis--1. The patient needs plasmapheresis 2. The patient needs dialysis 3. The patient has some rare and exotic thing that NO ONE will ever guess because some crazy writer and a Medical consultant had too much Champagne the night before... I just LOVE that show. Ok back to you-- sending you healing vibes as they ablate your poor firing heart tissues... Oh and the pictures and your videos are really THE best part. Drafty little hospital gowns should be your next song... Giant nursey hug to you! Sharon in rainy Corvallis OREEEEGONE. @Sharon ...I like it! "Drafty hospital gown ... buttoned up, and fallin' down" Love those Nursey hugs. Thanks!